KAZAN, Russia — In keeping with the Led Zeppelin selection that blared out from the PA system before the start of the finals here at Kazan Arena, the next-to-last night of the 2015 world championships, Saturday’s racing made for another edition for the U.S. swim team of Good Times Bad Times. Heading toward Rio 2016, the question: is this Dazed and Confused U.S. team ready for prime time? Katie Ledecky cemented her status as the world’s most dominant swimmer, setting her third world record of the meet in winning the 800 freestyle in a world-record 8:07.39 — a whopping 3.61 seconds under her own prior mark. Earlier this week, she won the 200, 400 and 1500 and, as well, anchored the 4x200 free relay to victory. For her, clearly, The Song Remains the Same. 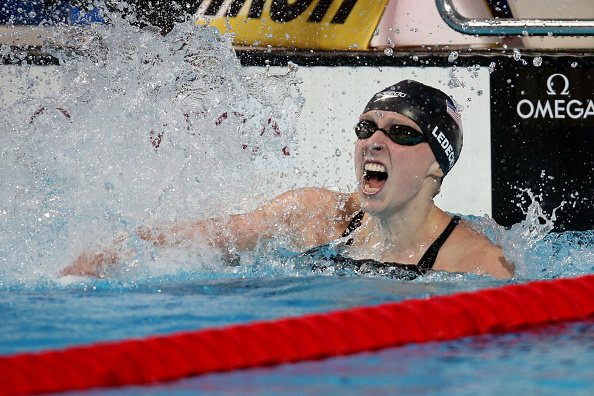 In two world championship appearances, Kazan 2015, and Barcelona 2013, Ledecky has only gold medals. Nine finals, nine golds. Plus one Olympic final as well, at the London 2012 Games: gold in the 800. The 800 world record she set Saturday? Ledecky’s 10th since 2013. For far too many others on the U.S. team, would the appropriate Zeppelin selection maybe be I’m Gonna Crawl? Or, in reference to the rest of the world, You Shook Me? It used to be, of course, that the U.S. team gave No Quarter. American racers would Bring it On Home, remorselessly, on the way toward winning a haul of medals. With just one more day to go at these championships, the U.S. team stood atop the medals count, with 18, seven gold. That, though, is a considerable distance from the 29 medals, 16 gold, the U.S. took home from Barcelona 2013. The only Americans with individual golds: Ledecky and Ryan Lochte, winner of the men’s 200 individual medley. The Australians have six gold medals, 12 overall. Six equals the Aussie gold total from: the Shanghai 2011 worlds plus the London 2012 Games plus the Barcelona 2013 worlds. China has 12 overall medals, too, four gold. The British team, the surprise of the meet, has nine overall medals, five gold. While there are reasonable questions about whether the U.S. selection process for this meet is still the way to go — the team was picked a year ago — the indisputable takeaway from this meet will be that the rest of the world is more than capable of winning races the United States had, for years, straight-out owned. Australian Mitchell Larkin’s victory in the men’s 200 backstroke marked the first time an American had not won the event at a worlds or Olympics since 1994. Larkin became the first swimmer since world record-holder Aaron Piersol to win the 100 and 200 backstrokes at a long-course worlds. Ryan Murphy finished fifth, Tyler Clary — the 2012 London Games gold medalist in the event — seventh. At the Barcelona 2013 worlds and again the year before, at the London 2012 Games, the Americans swept the Olympic-event backstrokes (the 100 and 200 — the 50 is not an Olympic event). Here: Australia swept the Olympic-event backstrokes. In the men’s 4x200 free relay, the United States had won gold at every world championships and Olympics since 2004. Here? Silver, in 7:04.75, 42-hundredths behind the British, anchored by new sprint sensation James Guy, winner here of the 200 freestyle itself. Last Sunday, the U.S. men’s 4x100 relay team failed to qualify for the finals. It was a measure of how seriously the Americans took the final event on Saturday's program, the 4x100 mixed free relay, that they threw out four of the biggest names on the team: Lochte, Nathan Adrian, Simone Manuel, Missy Franklin. They won, in a world-record 3:23.05. In San Antonio, meanwhile, at the U.S. championships, which are going on simultaneously, Michael Phelps — swimming there instead of here because of the fallout from his drunk-driving case — turned in the fastest 200 fly time of the year on Friday, 1:52.94. That also marked Phelps’ fastest time in the event since 2009. It would have won here by 54-hundredths of a second. The sole American in the finals, Tom Shields, finished fourth, in 51.06. Cseh took second, in 50.87. Joseph Schooling, in 50.96, grabbed third, the first-ever swim worlds medal for Singapore, and just one day before its 50th National Day. Phelps won the 100 fly in London. He did not swim two years ago in Barcelona. Le Clos is now the back-to-back worlds winner of the race. Adrian had looked awesome in qualifying for the men’s 50 free, setting an American record by going 21.37 in the semifinals. That was, briefly, the year’s top time. In Saturday’s finals, Adrian took second, in 21.52, 33-hundredths behind France’s Florent Manaudou, who put down a 21.19. In the women’s 200 backstroke, which went down before the 4x1 mixed relay, Franklin turned first at 100 and 150 but finished second, behind Australia’s Emily Seebohm. The winning time: 2:05.81. Franklin: 2:06.34. Franklin had won the 200 back at Barcelona 2013 and Shanghai 2011 and, as well, at London 2012. She is also the world record-holder in the event, 2:04.06, set in March, 2012. Seebohm’s final 50 meters: 31.4. At 150, Franklin was up on Seebohm by 1.31 seconds. Seebohm ended up winning the race by 53-hundredths of a second. That is — a lot to think about. — A gold medal Sunday in the 400 free. — A world record in Monday’s 1500 prelims. Another world record in Tuesday’s finals, followed 29 minutes later by racing for a place in the 200 free finals. — A gold medal Wednesday over an incredible field in the 200. — The anchor leg Thursday in the winning 4x2 relay. And then, Saturday, world record in the 800. “I just couldn’t be happier with how that swim went, how this whole week went,” she said late Saturday. She also said, “I kind of thought it would be 8:08, so to see the 8:07 was, like, great. “You know, it’s August 8th. I was swimming the 800. And, believe it or not, it would have been my grandpa’s 88th birthday. And so we were joking yesterday, my family, you know we don’t really talk about times or anything but they were just kind of telling me all these things. They were, like, 8:08, you know! Just, you know, a Whole Lotta Love.